A strong part of the Casey’s General Store brand is its community focus, according to Nathaniel Doddridge, director of fuels at Casey's General Store, so offering E15 was a natural fit that underpins that focus. While we eagerly await EPA approval of year-round E15, let’s not forget that roughly one out of every 10 vehicles on the road today is a flex fuel vehicle (FFV) that can use ethanol flex fuels containing as much as 85 percent ethanol. Mike O’Brien, vice president of market development for Growth Energy, says that with seasonal restrictions on E15 sales potentially being lifted in time for next summer’s driving season, interest in selling E15 has increased among gasoline retailers. If you own or operate a convenience store or gas station, you’ve probably heard something about E15 over the last several years, and most of it probably wasn’t very good. Maybe even frightening. But, the truth is you don't have to be scared of E15. 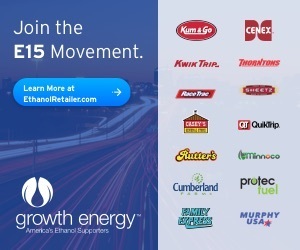 With the U.S. EPA expected to amend rules allowing year-round E15 sales next year, retailers don’t have a lot of time to decide whether to begin offering E15 prior to the 2019 summer driving season. The Renewable Fuel Standard is one of the great success stories for our nation. Motorists have seen cleaner, more affordable choices at the pump, and our corn farmers have seen demand for their product grow through renewable biofuels. Fresh off a trip to Mexico to tout the benefits of ethanol to retailers, the American Coalition for Ethanol’s Senior Vice President Ron Lamberty said interest in ethanol among the country’s retailers is piqued. The Renewable Fuels Association has announced that Growmark Energy has started offering pre-blended E15 at its company-owned terminals in Amboy, Ashkum, and Petersburg, Illinois, Fort Dodge, Iowa, and St. Joseph, Missouri. Cooperative Producers Inc, a farmer-owned cooperative, has added E15 at its fuel site in Funk, Nebraska, according to the Nebraska Ethanol Board. This is CPI’s third location selling E15 in Nebraska. On Nov. 8, Growth Energy announced that American drivers have driven another billion miles, totaling 6 billion, on E15—a fuel with 15 percent biofuel that is approved for all 2001 and newer vehicles.